J-B Weld Company has been in business since 1969. They make a range of specialty epoxy putty products created and formulated for strong adhesive repairs, inluding J-B Weld, the World’s Strongest Cold Weld! Don’t Scrap It – J-B It! J-B Weld products made in the USA and are imported into New Zealand by Stewart Dodson of Altered Performance in Auckland. Quick Setting Cold Weld, sets strong in 4 minutes! Drill it, Grind it, Machine it! Don’t Scrap It, J-B Weld It! Bond or repair most anything, easy to use. Automotive, marine, farm, garden, household, plumbing, hobbies, crafts & more! J-B Kwik offers a fast solution to strong, permanent repairs! As one of a family of strong, Cold Weld Epoxy products, J-B Kwik is designed for strong repairs of automotive, household, farm and marine items. Instead of a costly replacement, you can permanently fix it with J-B Kwik. Mixing: Squeeze equal parts of steel and hardener onto a clean, disposable surface and mix thoroughly. Surface Preparation: Clean surface from dirt, grease, oil etc. Remove pain, primer, rust etc., before applying. For best results use acetone or lacquer thinner for cleaning and roughten surface with file or coarse sandpaper to provide the best weld. Application: Apply with appropriate tool in an even coat, weld bead or extruded shape as needed. Drying: Sets in 4 minutes and in 4 hours J-B Kwik is fully cured. If temperature is below 40°F (5°C) then set time is longer. No clamping is necessary, only minimal pressure is required during setting. J-B Kwik is one in a family of specialty epoxy putty products, created and formulated for strong adhesive repairs. Also look for J-B Weld, JB Stik, Water Weld, Industro Weld, Marine Weld, Mirror Weld and Perm-o-seal. PRESENT; Terry Burgher, John Cooney, Laurie & Dawn Darrington, Kevin & Jenna Hardie and family, John & Jeanette Grant, Don & Wynne Howarth. It was good to see Terry again after a lapse of some months. This was a most enjoyable evening; the food was good and the company better. Dawn brought brandysnaps – which proved extremely popular while the children discovered they liked feijoa cake! They also liked the doll’s pushchair, the model cars, the toy garage and the steam engine. In fact the only one who didn’t enjoy the evening was the cat. We didn’t see her until five minutes after the last car left. It turned out that it was Wynne’s birthday so a cake was hastily transformed into a birthday cake and we all sang an appropriate song. The committee would like to wish everyone who missed this early Xmas celebration, a very happy celebration of their own and we look forward to seeing more of you in the New Year. Hi all, I am with Le Club 404 (France) – their Canadian representative – and since the beginning of 2009, we have been drawing up a list of all remaining Peugeot 404s in the world. We have developed a separate list of Peugeot 404 Coupés and Cabriolets and another for 404 Sedans, Estate and Utes. Cars are listed by serial/chassis number (VIN). This avoids duplications, and – given the long time frame over which the Registered cars have been added – this is a risk to be avoided. We have, for example, some cars in the Register which have changed hands at least 4 times, since the car was first registered! We are also attempting to get a photograph of every registered car, this will of course be a challenge! The 404 C list is far better developed. This is only because the “starter data” came from Le Club 404, which until the late 1990s, was a club exclusively for the Coupé and Cabriolet models. So they had 25 years of 404 C member information and that in turn led to a very healthy start for the 404 C Register. As of October 17, 2011, there are 1558 404 C cars in the database, and we started off with about 115o cars in January 2009 when I picked up my present role. Another factor in this is the low production figures for the C model: only 17,223 were built. So we now have 9.05% of the 404 Cs in our database. The 404 Sedan, Estate and Ute list is less well developed, both in terms of absolute numbers and of course in terms of the percentage of original production. There are 1185 cars in this Register on October 17, 2011, which as a percentage of the 2.8 million production is a grain of sand on the beach. That’s why I am posting here, we need help for these Registers to thrive. One purpose of the Register is to help Le Club 404 to use the number of remaining 404s as an argument in favour of more manufacturer parts support. Le Club 404’s President is employed by Peugeot and so there is every chance that there will be some influence there. Another reason is just to satisfy curiosity – how many are left in the different parts of the world? This will help us begin to answer that question. There is a facility now to upload a photograph of the car, and the website names the photo file after the entered serial number, ensuring automatic correlation. I would encourage any 404 owners to enter their data and a photo there. 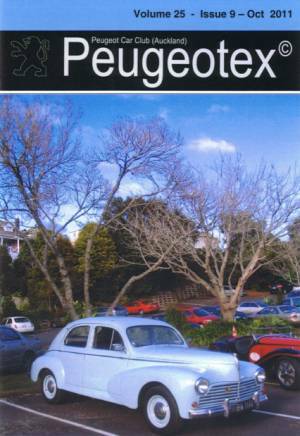 The October issue of Peugeotex has been printed, packed and posted and will arrive in member’s letterboxes in due course. Is The 108 Coming South? The Pride of Ownership competition is an annual competition to score your Peugeot on how well looked after it is with respect to its use. So not only is the presentation of your car taken into account, but also its age and mileage! Each age grouping (eg -04, -05, -06 etc) are judged together, so bring along your 309 to gain an unfair advantage! Come along and get involved! Display your car, you can compete with your committee members if your car is immaculate, or if it looks like you have just been paddock bashing in it! And the judging will be done by you (in a team with others). And make sure you vote for the People’s Choice award too! The November club night will be held at Continental Cars showroom in Greenlane. We will have the opportunity to look at their current range of new cars, try them on for size, grill the sales staff and carry off copious quantities of advertising material (and no doubt they will accept a deposit should anyone be in the mood for purchasing a new car!). Sorry, the Continental Cars visit has been Cancelled! We are organising another track day at Hampton Downs Race Way for Sunday 30th October 2011 [Update, we are now back to our original date of 30th October after considering a change to a date in September]. This will be our 3rd outing as a group, and have endured both dry and wet conditions over the past two meets and to date no incidents. We are endeavouring firstly to secure the whole day as a private day through Playday (fully managed by them, Ambo on site as per standard run Playdays, driver briefing etc) . We require at least 40 entries at $200 to cover the cost through Playday, if we don’t get the required numbers then we can secure individual groups (4 groups max) 15 cars max in one group, at a cost of $135 each, or a second group etc. So for one group you will end up with 6 session spread over the day of around 15min duration, and if it’s a dry day well your car could welcome the rest, and you have time to watch the other 3 groups have their fun. But ideally we would like to secure the whole day, so we need some commitment to make this happen, We require a deposit of $100 paid up front so we can book the track, and the balance of $100 on the day. The deposit will be sent to Playday to secure the day, if we don’t get at least 35, then we will secure some groups at a balance of $35 on the day. We will be securing a trackside apartment on the Saturday night at $ 50 per person so let me know if you require this as well, would encourage you to take this up, early start on the Sunday morning, better to be fresh!! For those of who would like to arrive midday Saturday, you can watch the cars competing in the Drift Day in the afternoon or maybe enter this one as well! You will require clean cotton overalls and racing helmet with closed footwear, you can hire helmets at the track and 98 fuel is also available. To secure the whole day Sunday 30th October, please reply back by July 15th, acknowledging your deposit, what car you will be using, if you require helmet and if you would like a room.